The Accra Regional Police Command has issued a stern warning to foreigners living in Ghana to abide by the laws of the country and eschew all forms of crime. The Command said it will however not accord preferential treatment to Ghanaians who also break that law. The warning comes on the back of a series of criminal activities in the country involving foreigners. The recently reported case involving a foreigner in the country was the kidnapping of a 50-year-old woman at her Amasaman home by two Nigerians. One of the suspects in the matter, Isaac Aigbona, has been arrested, while the other is at large. 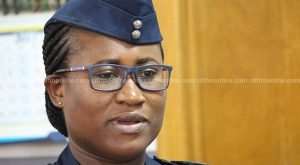 The Public Relations Officer of the Accra Regional Police Command, DSP Afia Tenge said foreign nationals in the country must be law abiding. “What the police is stating is that the foreigners, those who are here and they are on a genuine business, they should not take the hospitality of Ghanaians for granted and decide to ride on it because this kind of emerging crime of kidnapping that we are seeing in our country is quite unknown to the Ghanaian community. If we are having this type of crime, we will not create the enabling environment for them to perpetrate this kind of crime. We are going to ensure that we map up strategies to deal ruthlessly with this kind of crime,” she said. The case of three girls who were kidnapped in the Western Region last year also has a Nigerian as the key suspect. Some Ghanaians are already calling for strict immigration rules to at least screen and monitor the activities of foreigners who enter the country. The situation has reached such as height that the Deputy Controller General in charge of operations at the Ghana Immigration Service, Lord Afrifah had the cause to sent a word of caution to foreign nationals in the country, that the Service will not hesitate to deport them if they are found guilty of a crime. It is reported that over 800 foreign nationals from the sub-region were deported in 2018 for various offences including commission crimes, most of which was cyber fraud.